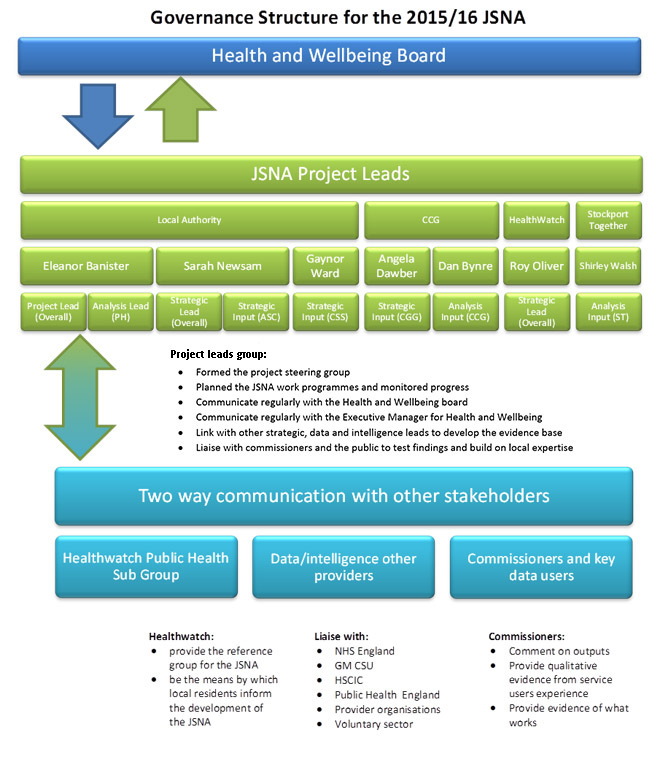 In 2007, Stockport Council and NHS Stockport jointly produced the first JSNA for Health and Wellbeing. The 2007 JSNA analysed a large body of data and identified priority issues for the borough. The priorities were then adopted by Stockport’s Health and Wellbeing Partnership Board and were integrated into the strategic plans of both the council and the NHS. In 2011, the Stockport JSNA was refreshed to see whether the priorities identified three years earlier had altered. Priorities were amended in the light of the new analysis and were agreed by the shadow Health and Wellbeing Board. The needs and priorities identified by the 2011 JSNA have underpinned the development of the Health and Wellbeing Strategy and also have informed the health elements of other corporate strategies. The JSNA findings directly influence the commissioning of health, social care and preventative services, and the intelligence gathered is an important part of the commissioning cycle. A clear message from both national and North West reviews of the 2007 JSNA was the underutilisation of the JSNA in commissioning processes. Locally, therefore, we tried to ensure that in 2011 the JSNA also supported commissioning more directly – reviews of which can be found in previous papers to the Health and Wellbeing Board. Use of the CCG’s online consultation platform to publish first drafts of each briefing to test the analysis and conclusions with key commissioners and to achieve a shared consensus on key issues. To develop the final summary report, key findings from each of the briefings and the priorities arising from these were identified. These were then tested and developed in discussions with the project leads’ group, the Director and Deputy Directors of Public Health and Stockport HealthWatch. Other key stakeholders were again consulted electronically before the priorities were finalised.